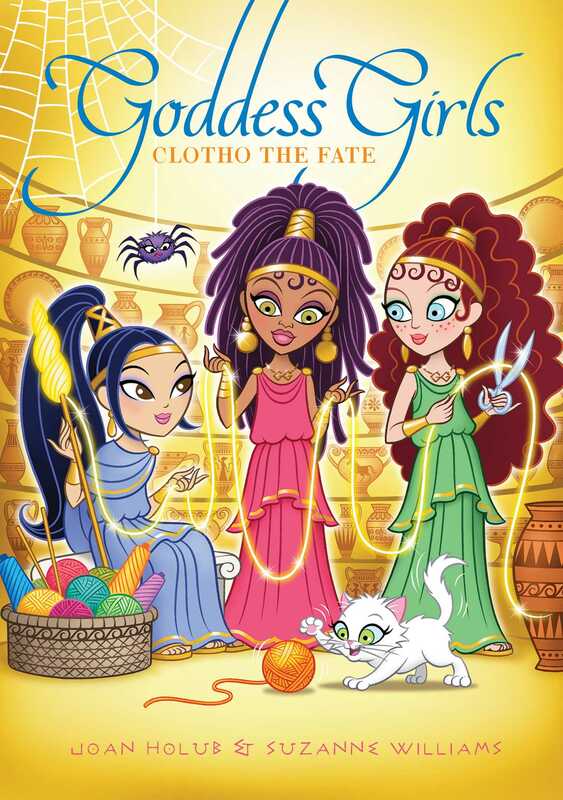 Get to know Clotho, one of the Three Fates, in this twenty-fifth Goddess Girls adventure! Eleven-year-old Clotho is always linked with her two big sisters. Together, they are all the Three Fates, with abilities to predict events in mortals’ lives. There are a few rules that the all-powerful Zeus has decreed for them, including a strict no-mingling with mortals policy. After Clotho discovers letterscrolls from unhappy mortals who don’t love their fates, she wishes there was a way to try and earn their respect. During a secret trip to the Immortal Marketplace—where there is always a chance to run into mortals, too!—Clotho finds herself in over her head as she gets swept up in a competition to celebrate the opening a new store. A competition where her identity as a fate could be revealed at any moment! If that weren’t enough, Clotho must face up to an old mistake she made several years ago that broke one of Zeus’s other rules: Never interrupt the telling of a fate. It could mess up a mortal’s whole life! Can Clotho manage to untangle the mess she has made while finding a way to bring the mortals and the Fates together?